At this time of giving thanks, we are grateful for the Wrong Thinkers at Patagonia. While retailers across the land have been gearing up for months for the windfall of a contrived shopping frenzy called Black Friday, Patagonia has been busy thinking wrong about how they might use all that pent up shopping gusto for good. We've long admired their counter-consumerism culture. In recent years their "Don't Buy This Jacket" ad has brought a smile to our mouths and tears of appreciation to our eyes. How can they be so damned smart, do damned right, and so damned good? Patagonia, you are officially our Thanksgiving Think Wrong Heroes! Keep kicking the status quo where it counts! Worn Wear: a Film About the Stories We Wear Presented by Patagonia Directed by Keith, Lauren, Chris, and Dan Malloy. Worn Wear is an exploration of quality—in the things we own and the lives we live. 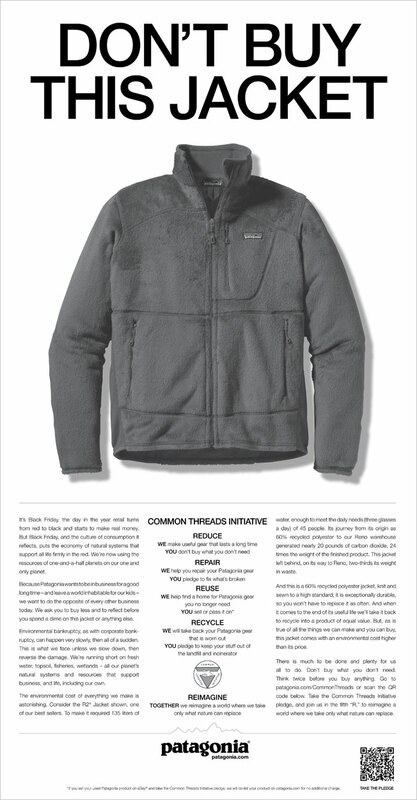 Check out this CNN Money Holiday Shopping article to learn more about Patagonia's bold move on behalf of our planet. "The threats facing our planet affect people of every political stripe, of every demographic, in every part of the country," Patagonia CEO Rose Marcario, wrote in a company blogpost detailing the Black Friday effort. "We all stand to benefit from a healthy environment."